This coming week is going to be a BIG beer related event week for me, so here begins the first of three posts for the week – two will be on breweries, and one will be a zine review (yes, people write zines about beer! How cool is that?). Don’t worry, there’ll be lots of food action to go along with the beer because good food does go well with good beer. After accidentally sleeping in due to a disco nap, I (legally) raced on over to the Mountain Goat brewery in Richmond one rainy Friday evening. I may have driven past it a few times…in the dark, you can’t really tell what it looks like as it blends in perfectly with all the industrial buildings around. Once inside, it’s actually rather classy – pretty much a converted warehouse with big communal tables and lots of space to encourage bike-riders to bring in their modern-day chariots. The photo above is of the vats, and it reminds me of that scene in Goldeneye where Bond has to bomb similar tank-like things after Trevelyan has crossed him. Um, I remember it so well because of the game on Nintendo 64, don’t judge me! I’d never been before to the Mountain Goat brewery and was lured by the promise of their beer ‘Rapunzel’ being served three ways – regular, oaked, and ‘Randied’, which meant ‘hopinated’. 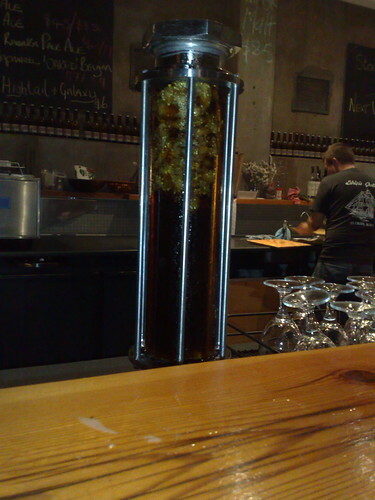 Yes, beer is very technical…to be honest I’m not exactly sure what the hopinator does – I just know that the beer is rendered hoppier by being run through it with fresh hops. Don’t worry, you don’t get any floaties in your beer. The beer being run through the hopinator changes every time the brewery is open to the public (generally Wednesday and Friday evenings from 5pm). Rapunzel is brewed in the style of a true Belgian Abbey beer. In the days of old monks used to brew these beers with the help of the almighty (we assume). We’ve taken a leaf from their book and combined Pilsener Malt, German Hallertau hops and a Belgian Yeast strain to produce a full-on, 7.7% alc/vol slice of Flanders. This current 2010 version also comes with extra baggage – there’s an Oaked version. Last May we filled a chardonnay barrel with 2009 Rapunzel, and we let it sit for 9 months. The French Oak has imparted distinct vanilla, apple and honey characters that just can’t be delivered other than by oak. We blended it back with a little of the 2010 Rapunzel, and whammo. It’s really something out of the box (barrel?). Ooh, she was yummy – quite alcoholic for a beer, and not quite like wine, but possessing some characteristics thereof. The barrel definitely left its mark on the beer. Hopefully I’ll be able to compare to Rapunzel regular when she’s on tap at the Local Taphouse in St Kilda. Bit O’ Meat was at the brewery beforehand and got to sample more of the produce, to put it rather finely. I got to taste some of his Riwaka Pale Ale, some of the Randied Galaxy IPA, and the Steam Ale on tap. Steam Ale tastes a little bit like Coopers Sparkling – but not so in the bottle. The Riwaka was hoppy, but not nearly as much as the Galaxy, nom. Amusingly, he also made new friends – some lovely engineering/dancing types. They were capital fellows. It was like walking into an episode of Cheers or something. My last drink was the Surefoot Stout, which was more like a really robust, smoky porter, though very much a stout in colour. To have this with oysters would have been a damn treat. If you don’t like dark beers, or stouts, I still think you should give this a go. Perfect given the day had got so chilly what with all that rain. 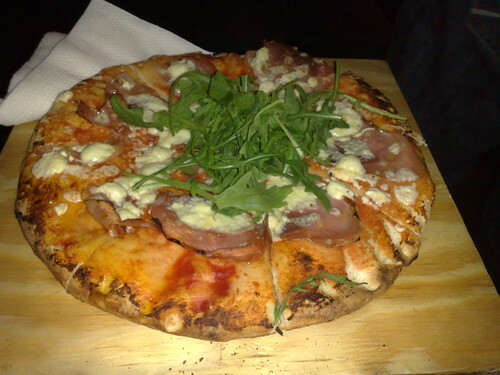 If you check my personal Twitter profile, it says that I’m a beer, cheese and prosciutto assassin, and so I ordered a pizza so that I could indulge my appetite for my culinary holy trinity – a prosciutto and cheese pizza. Imagine it – pizza slice in one hand, pint glass in the other. Is that not the perfect Friday night? It’s bittersweet looking back at this because my loves are also my vices, and I’ve been instructed to drastically cut down my appetite for all three (with great success, I might add). Richmond’s not too far from the city centre and it’s excellent fortune to have a brewery in a metropolitan area. As soon as I went, I caught myself starting sentences with “Next time I come here, I’m going to have…” and the like. I’m puzzled as to why so many people (and I’ve definitely been guilty of this myself countless times) go to average pubs and order pint after pint of the commercial swill when we have places like this. I admit it – I lost more than my fair share of brain cells on Carlton Draught jugs (yeah, not pints, but JUGS) at the weekly social night for a musical society I’ve previously had dealings with. Is it that we’re cheap, or stupid? Probably both! 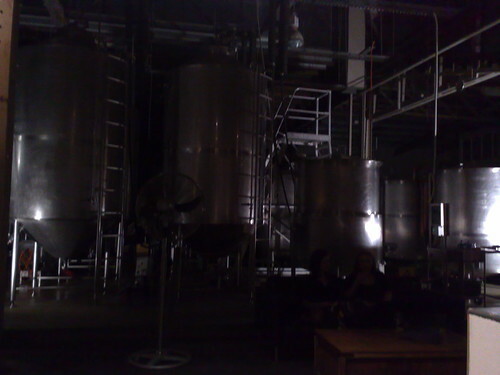 This entry was posted in craft beer goodness and tagged Melbourne, microbrewery, Mountain Goat Brewery, Rapunzel, Richmond, Victorian microbrews on May 17, 2010 by gem.